[i am a dekaphobic]: Wee Nam Kee Philippines Celebrates 5 Years with Php 299 Unli Hainanese Chicken Promo! 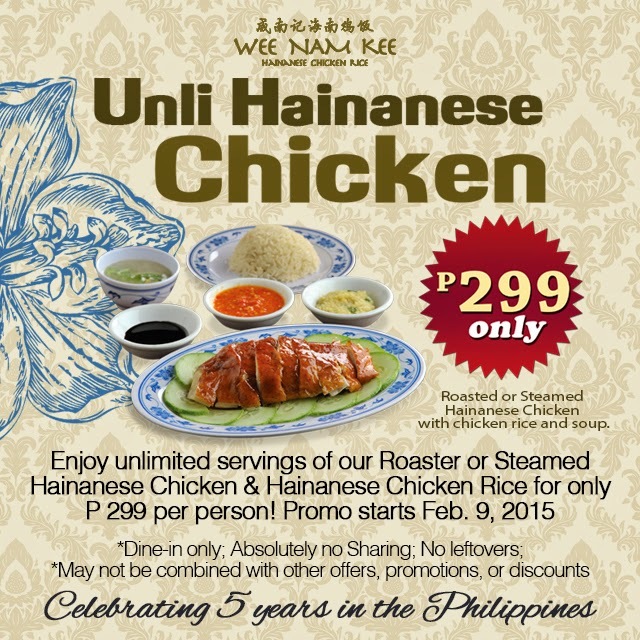 Wee Nam Kee Philippines Celebrates 5 Years with Php 299 Unli Hainanese Chicken Promo! So what are you waiting for! Enjoy Wee Nam Kee's signature Hainanese Chicken dish and Hainanese Chicken Rice, that made them famous, to your heart’s content available from February 9 to 13, 2015 only! Established in 1989 in Singapore, Wee Nam Kee has been serving Hainanese chicken rice for the past 26 years. Universally recognized as the gold standard of Singapore’s Hainanese Chicken Rice, Wee Nam Kee now has seven branches in the Philippines: Ayala Triangle Gardens, Serendra, Glorietta 2, Alabang Town Center, Promenade Greenhills, Trinoma Mall, and the new Fairview Terraces Mall. Wee Nam Kee continues to expand both domestically and internationally with more locations planned for Singapore, the Philippines, and beyond.